If you’re wondering why it’s been kind of quiet here on Parkeology, it’s because I’ve been working on a new obsession. It’s a little project of mine. An insane, magnificent little project of great worth to humankind. I mentioned this way back in April (4/7), which is appropriate because this mission is entitled WDW47. We are now only 10 days away on this, and I’ve kept it under wraps for a few reasons. The first is obviously security. I didn’t want the communists or the terrorists or the cast of Glee to find out about this and wreak their usual havoc on our national infrastructure. The second is that due to the nature of this mission, there was simply no point in announcing it earlier. Circumstances beyond our control dictated when WDW47 could be attempted, as shall be made clear below. And the third — possibly most important reason — every single person I have confided in on this has predicted complete and utter failure. I take no great pleasure in embarrassing myself for the world to see (for the world will surely be watching). Teevtee, who has been an invaluable strategist and architect in the planning of WDW47, has been near despair for the past several weeks, due to insurmountable obstacles that threaten to thwart our quest at every turn. Together, we have been ingenious in our pursuit of out-of-the-box solutions — reworking our plan, tearing it down, starting over — squeezing every last drop of efficiency beyond the capacity of mere mortals. And yet still we find ourselves with roadblocks that no human being has ever overcome. I have scoured the internet for strategies, research papers, military maneuvers. And in the end, they all fall short. My own wife has smiled politely, offered me her full support, patted me on the head, and reminded me not to be sad when the crashing failure inevitably comes. Yet here we are, on the brink of another great step in civilization. Like the first lunar landing, Parkeology will send one man into the field in an attempt to make history — or die trying. As a child, my parents were wonderful people who took us to Walt Disney World every year. There were four kids in my family, which could be an expensive proposition when talking about WDW. So we would make our annual trip… and spend one day in the parks. A single day. That was our reward. It didn’t matter when EPCOT Center opened in 1982. We had to choose our park, or deal with hopping for that one day. When Hollywood Studios opened in ’89, I was in high school. We still went only one day. It was not until a trip in college where I finally went to WDW on multiple days. I had always been obsessed with the parks. I would study the guidemaps for hours — the old guidemaps were booklets, with pages and staples and everything. I had shops memorized. Restaurant menus ingrained in my consciousness. And most of all, I knew the rides. I became obsessed with planning for my one day in the parks. With only so many hours to work with, I needed to chart a course through 6 themed lands of Fantasy, Adventure, etc. in the most efficient manner possible, accounting for traffic patterns, ride times, crowds, bathroom breaks. I was driven at the highest level to see every possible attraction. I drove my family nuts. This led to a particularly horrible moment sometime during our one trip to Disneyland, where I forced my sister onto the Rivers of America 4 straight times in a row, because I had to see everything, and Columbia, Mark Twain, the Keelboats, and the Canoes were all listed separately in the guidemap. It was most efficient to see everything in Frontierland all at once. Ah, those dreaded keelboats… Years later, on my honeymoon, I warned my wife that we would be seeing everything at Walt Disney World during our week-long stay (not a problem with that many days at the parks). She gamely played along, and since we never waited more than 20 minutes for anything, we had a blast. Until that last day, when I forced her into a 50-minute keelboat line because it was the only thing left to check off. For years, I have always wondered what it would be like today, if I only had one day at the parks. The idea of seeing every attraction is simply impossible without breaking the laws of physics. The cumulative attraction ride/show time is greater than a single operating day. And what really constitutes an attraction anyway? Surely Peter Pan’s Flight and Hall of Presidents and those things count. But what about Wishes or Illuminations? What about all those World Showcase cultural exhibits? How does one define “seeing” the Boneyard playground, or what happens if I skip out on a few Innoventions exhibits? Too much gray area, nevermind the fact that Lights Motors Actions runs 2 shows a day, and they overlap with Beauty and the Beast and Indiana Jones. No, it is not possible. But yet it occurred to me that there was a special type of attraction for which there is no wiggle room. No way to cheat. A clear start and end, and easily categorized. The all-important, all-favorite, all-mighty Ride. 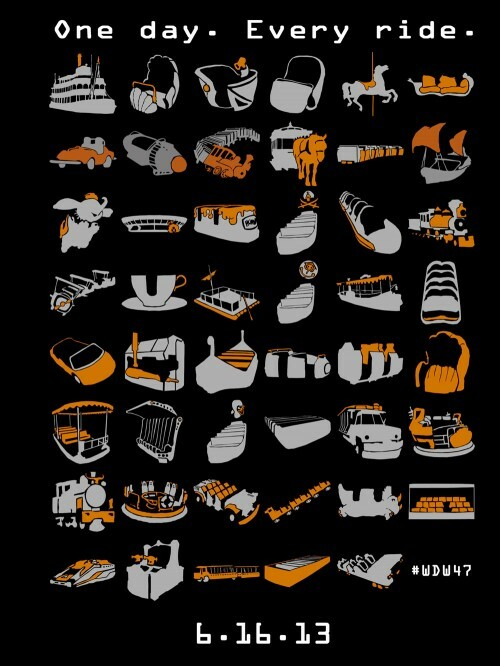 Yes, 47 rides spread across four parks. An official list taken straight from the official Disney website, of every attraction that involves a vehicle. Big E-ticket rides, small A-ticket rides. Rides with extra-long ride times, rides with painfully short durations. Rides that shake you, spin you, rattle you, drop you, bore you, soak you, race you, and in one awful case odorize you. 47 of them. All in a single day. All 47 rides must be experienced in a single operating day (depending on hours, the operating day may actually end on a different calendar day, if open until the wee hours of the morning). No outside help. I must be able to attempt this without having a team of people gathering up FastPasses, ferrying me from place to place, getting backdoor-ed by Cast Member friends, etc. No breaking park rules by cutting in lines or being deceitful to other guests or Cast Members or jumping off the Jungle Cruise early so that I can swim back early. Certain rides do require a judgement call. The WDW Railroad, for instance, has 3 stops it can make. For the sake of sanity, I’m going to consider riding any single leg of the round trip as good enough. There are several Main Street Vehicles (Omnibus, Horse Cars, Fire Engine, etc. ), but the official site groups them all together, so I only need to ride one of them. Mission Space has Orange and Green sides, but I only need to see one (and I can assure you that it will not be the Orange side). Everything else is fair game. I can utilize features that are available to a reasonable park guest, such as FastPasses and Extra Magic Hours, both of which are critical to success. My only other weapon is my wits. I read in one of those unofficial guides a long time ago that the average family sees about 8 attractions in a single day. I’m aiming for 6 times that, with a minimum of 3 park hops in between, in the middle of summer tourist season. And yet I feel pretty good about my plan. I will be live tweeting the attempt (at least until my phone battery runs out, so if you’re bored in 10 days, follow us on Twitter (hashtag #WDW47) and see how far I get. Right now, the prediction on the table from a family member is 30. I’m pretty confident I can beat that. What do you think? How to Survive the Parkeology WDW47 Challenge Parknado! Congratulations! My son and I are doing a four park challenge next Tuesday. We have flexible rules but want to get as much as we can done. We’re starting with animal kingdom, then have fast passes at DHS, I’m worried about afternoon/evening Magic Kingdom, do you think there will be fast passes left for some rides there before 6:30-7p? We have three hours of extra magic hours at Epcot till 11, so we feel comforted by that. It is a Tuesday in February but it’s Valentine’s Day, which made for a wrench into it. We are going to use the Disney express transportation for park to park I think will help. I don’t think I’m crazy enough about finishing everything I want to go back to a park I’ve been to already. Any advice? Lots of questions! Yes, you will probably be able to pick up MK FastPasses during that time, but maybe not for the biggest rides. There are a couple rides under refurbishment during that day, so our challenge wouldn’t be possible, but you should just have fun trying to see as much as you can. The best advice I can give is to have a plan ahead of time. Touring all four parks in a single day is exhausting but fun. If you want to see the plan we used, I recommend watching our video, which you can get to from the WDW47 Challenge link at the top of the page. Thank you for writing in! This is my favorite type of comment. I love that people think this is just completely impossible. It makes it all the more fun that we actually did (and so have many others). I do think it is easier now than ever, with the changes that have been made to the FastPass+ system that allow you to pick up extra FP for decent rides very late into the day. This is definitely not a challenge that a casual tourist would even want to attempt, as it is much more like running a race than it is being on vacation. So you don’t have to believe it, but the fact remains that we did it, and completely without outside assistance. Congrats! I’m thinking about trying this solo in May. Don’t listen to the skeptics. I’m not surprised someone named DisneyCheater is hesitant to believe. This is awesome! We did all 4 parks with our kids back in early May, and it was exhausting, but lots of fun. We weren’t trying to ride every ride or see every attraction, but we wanted to do those 2-3 rides/attractions that really screamed “that” park to us–so safaris in Animal Kingdom, Spaceship Earth in Epcot, etc. Somehow, we completely missed that we did this on May 4th, so the Studios were packed, Star Tours went down, and the GMR thus was a 40-minute wait. We went and did Catastrophe Canyon instead! Good luck, and May the Force Be with You! I am going in September and this is something I would try. Would Child Swap be and OK rule to utilize? I am taking my two year old grandaughter. Well Kathy a child swap would just slow you down since it would require in essence riding each of those rides twice. Trust me when I tell you that you don’t have a moment to spare if getting EVERY ride is your true goal. God speed, you magnificent human beings. I am very excited to hear about how this goes and wish you best of luck, Shane. I just looked at the calendar and obviously there is an MK EMH for the evening, but no early EMH. Thus, I assume you will start at Soarin’ and then head to DHS to try and either ride TSM or grab a Fastpass for it. If you go the Fastpass route for TSM, then the time you get could definitely have a huge impact on your day. This weekend, my family is definitely having a fun discussion about how we would try to accomplish this. We have carefully timed this JUST to miss any Snow White involvement… there is NO WAY WDW48 could EVER work. When you first mentioned WDW47, I figured this might be it. A friend and I attempted “Four Parks, One Day” back in February since that is among the slowest times (in terms of attendance). We made 21 attractions. Our dream died at DHS. Even on a slow day, by the time we got there, wait times at Toy Story, the Tower and Rockin’ Roller Coaster all exceeded an hour. One of those (or Soarin’ will; pick your poison) will always make something like his difficult. Best of luck. I’ll be chearing you on. Wow, this does not disappoint– all the build-up was worth it. You had better bring a water bottle and your best running shoes. I can’t even imagine attempting something of this magnitude. PLEASE fill us in on your strategies and plans, I can’t stop thinking about how I’d even start. I would love to see a list of the 47 rides and their durations. Energy Adventure is the longest, I assume, but what takes 2nd and 3rd place? Spaceship Earth is pretty long, and that backlot studio tour… wild. WILD. Good luck to you, if you complete even three parks that will be enough to impress the heck out of me. Water bottle will be in hand for sure. The heat today was punishing. You’re right on both Energy and Backlot Tour. Those 2 are the longest. The third is probably Great Movie Ride, Carousel of Progress, or the Riverboat. All three of those are close to 20 minutes each. 7 would be abysmal, but your other prediction may be very close. I predict if I come up short, it will be by 1 or 2 rides. Let’s put it this way: I did a dry run for the first two hours of the day about a month ago, and I hit 10 rides. I can’t keep up that pace all day, but I’m pretty sure I can hit 7 in my sleep. Just out of curiosity, how do you count Tom Sawyer Island? Do you just have to just take the raft over or actually walk around it a little bit? In any event, I have to say if you make this, it will be the logistical feat of the decade. The pentagon should hire you, or something. @Chris, I basically count a ride on the rafts to be good enough. But of course, once I’m at the island, I have to get back. So I’ll basically be going over and turning right around and coming back. You go Shane! Prove them all wrong! As an aside, I was once evacuated on Mr. Toad’s Wild Ride at Disneyland and I was in the train scene! Was cool to see it with the lights on at ten years old, but the illusion has been shattered. (I swear they use less fog now.) We got to walk the rest of the track out (not much, but Hell!). Definitely one of my favorite memories. Here’s hoping you’ll get one someday too, just not 6/16/13! @Julie, evacuation from Toad has to be one of the all time greats. With my luck, when I’m finally evacuated, it’ll be on something like Carousel of Progress, where there’s nothing cool to see. You should actually probably start at DHS or AK so you can get reasonably early FastPasses for their only major attractions. I feel that MK has so many rides you will have a better chance at finding random pockets less busy in the heat of the afternoon or lunchtime. Start at AK, bus to DHS, boat to back of Epcot, MonoraIl to MK? You really need to have a strong transportation strategy…. MK counts for more than half the rides, so it’s by far the biggest chunk of the day. I have reworked the plan several dozen times, but there’s actually a very good reason why I can’t start at DHS or AK. I’ll explain a little more in detail next week. ……….No Sum of all Thrills? Sum of all thrills is not listed as an attraction on the Disney web site, and is such a small piece of the overall Innoventions real estate, so I made a judgement call and excluded it, along with the Epcot FriendShips. Take peanut butter and lots of water. Sunblock too, don’t want to see you with a red neck and nose. Not sure how I’d look carrying a jar of peanut butter around but maybe I’ll give it a shot! Hahahaha! I’m sure I’ll be shouting that throughout the day, not just on Dinosaur! But just to clear up the confusion, my post was intended to merely list all the rides in each park, not necessarily give away the order I’m going to ride them in. I can tell you right now, Dinosaur will not be the last ride of the day. Good luck! It’s insane but amazing. Definitely a writeup afterward of your day would be appreciated. Count on a writeup, Vik! Knowing me, it will be filled with excrutiating detail. My wife and I have done everything at 3 of the parks in one day but haven’t attempted all 4. I can’t believe you are going to try this in the summer when the lines will be crazy. I think it could for sure be done in say January, February, April, or November. What makes the off-season hard is that too often something is down for rehab, and you are really limited on operating hours. Besides, I just find the idea of doing it during the summer really appealing. Unless I fail, then it was an extraordinarily bad idea. True. I guess I would try a practice run during off-season to test my game plan to see if anything can be tweaked before a summer run is all. There were a few practice runs of the various legs. Sunday will be the first time we put them all together though. This is incredible. I can’t wait to hear the results. This spurned 1/2 hour discussion between my wife and I about how we would attack this, which boiled down to a debate on which line was worse: Toy Story Mania or Soarin. All that time spent on Ellen’s Energy Adventure is going to be brutal. Kudos to you, MikeF, for calling out 3 of the major roadblocks to success. TSM and Soarin’ are easily the two hardest rides in terms of wait time. They’ll hit 60+ minutes and stay there literally the whole freaking day. Energy is the flip side. Never a wait, but a 40 minute ride. I’ve invested a lot of time in solving these challenges. I think I can minimize the damage on TSM and Soarin’, but Energy I’m going to have to live with. Shane, for your phone battery get a “mophie juice pack”, they are awesome! http://www.mophie.com. It’ll keep you charged all day long if you get the bigger one. Seriously crowd fund that junk on Kickstarter! Drew, thanks for the suggestions! I’m trying to hook myself up with a juice pack as we speak. And the idea about riding something in every park is uber intriguing. Kickstarter is a brilliant solution to that! The Advancement of Humankind continues! Wishing you the absolute best of luck. Better pack a well stocked fanny pack with high protein snacks and don’t forget to hydrate. One thing you did not mention.. I cannot recall a single trip we took were every ride in every park was running on any single day. We do go off season which may be the reason but I thought I would mention it. Charlotte, you have just hit upon the reason why I teased this in April, but could not attempt until June. The Mad Tea Party was under rehab for several weeks, and the Carousel was scheduled for a rehab hot on its heels. Pirates goes down later. But as of right now, unless Disney throws a curveball at me in the next few days, all RIDES are scheduled to be up and running. All it takes is a single ride going 101 to throw off the whole plan though. You, sir, are a man among men. Thank you, Steven! I agree that only the manliest of men would attempt such a feat. What about Animal Kingdom’s always-early closing times? Kaylin, that has been factored into the plan very early on. Animal Kingdom is open until 8pm on 6/16. Of greater concern are other ride closing times. Don’t forget that half of Future World closes at 7pm, and there are a few other rides in DHS and MK that have early closings (or later openings as well). I can’t wait to read the Live Tweeting! Godspeed. Thanks Annie! I’m trying to figure out a way to make sure my phone battery goes the distance. Oh my goodness, I am so excited for you. As far as the phone don’t they have chargers that you carry with you now to charge on the run. I know I’ve seen them on QVC. I really wish I was doing this with you. The things we do as big kids….truly a wonderful thing! I just wish I had a twitter type phone so I could ride with you as you go along. God Bless and Light Speed. Thanks to all the similar recommendations which have poured in regarding this, I’m looking into it! I’m hoping to find (and afford) the right solution to the battery problem. Sometimes I can be such a Luddite. Shane, you have inspired me to do this in Sept on my Trip. Be it that I will be there on the absolute least crowded days of the year, making it easier possibly, but, nonetheless, I must try as well. I shall be following you during your journey on twitter. Good Luck, God Speed. I do think this can be done. Jon, that excites me to no end. I want to see other people try this! (just not before I do, LOL). You may find September more crowded than you remember though. It seems like our slow season keeps getting more and more fast. My family and I will be there on the 16th, I wonder if we’ll cross paths at any point. Either way, we’ll be cheering you on from where ever we happen to be. You’re absolutely mad, but it would be fantastic if you could pull this off. I equate it with breaking the 4-minute-mile barrier. That’s awesome that you’re going to be there on the 16th though! I’m trying to get a shirt made up. Look for me! I have begged and pleaded with Shane to allow me to set up a support team. A focused crew spread out around the parks to collect Fast Passes for his use. This plan woudl not really be cheating, any normal guest with a support team could do this… if your family wants to give you their passes thats fine. But no… Shane wants it to be pure… and is likely destined to fail because of it. But nothing is over until we decide it is! Was it over when the Germans bombed Pearl Harbor? HELL NO! It ain’t over now, cause when the going gets tough the tough get going. Who’s with me? Lets GO SHANE!!!!! FastPasses are for sissies. This is the big leagues, son. We’re going to fake an injury and use wheelchair entrances. sorry, but wasn’t it the Japanese who bombed Peal Harbor? Also, I would so attempt this if I rode everything on this list and knew it wouldn’t make me puke! Of course it was the Japanese Amanda… that was a joke referencing a movie that you must not be familiar with. This is crazy, and yes, impossible. I wish you the best in surviving this. I am probably woefully underprepared for the physical side of this. I’m going to be on the go for 16 hours. You’re mad. MAD, I tell you! HAHAHAHAHAHA! Mad like a furry dog-like forest animal, maybe. Wow. Just wow. If you get on a ride and it shuts down before your completion, does that count? I wish the best of luck. If I was in Florida I would totally try this with you. Given that one of my lifelong goals is to be evacuated from a stopped ride (in spite of hundreds if not thousands of rides, this has never happened to me), I predict that this will be the ONE day where it finally happens. And thus ruins everything.